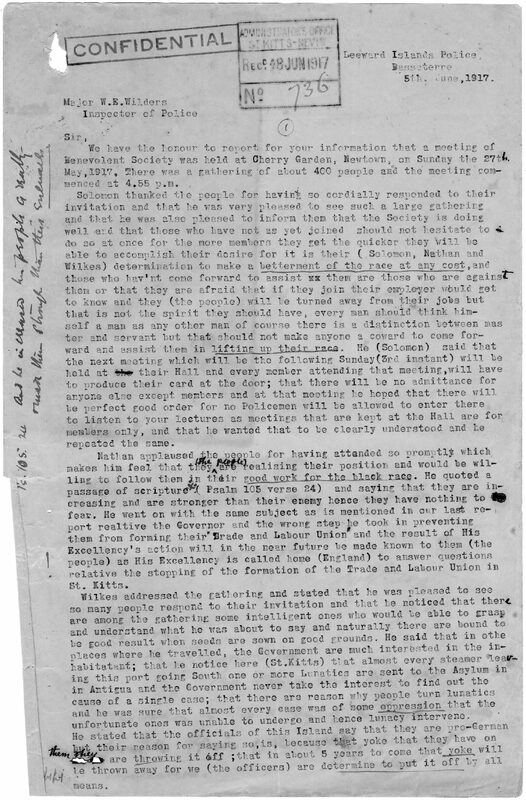 Our item today is the earliest surviving police report of a public meeting held by the Universal Benevolent Association or as it was called by its members, The Union. and assistance for the sick and injured members. Dues consisted of a registration fee of one shilling, then weekly subscriptions of 8 pence for tradesmen, 6 pence for male labourers and 3 pence for females. Those joining were expected to be disciplined and law-abiding at all times and to respect the decisions of the governing body especially in matters concerning wage negotiation and industrial action. The organizers were self-employed businessmen. The first president was Frederick Solomon a contractor and undertaker who had been motivated by workers’ complaints about low wages. The other officers were Joseph Nathan, the owner of the International Supply Association, a small retail business and George Wilkes, a barber. Both Nathan and Wilkes had lived in the United States for some years and had experienced the humiliation of racism and the benefits of organisation in the work place. Also among the organizers were William Seaton and A. St. Clair Podd both with strong connections to the merchant class and with concerns that were of a philanthropic nature. Their presence in UBA was short lived although they continued to take an interest in the welfare of workers. On the 22nd November 1916, the legislature passed the Trades and Labour Unions (Prohibition) Ordinance through all its readings. It instituted a fine of £50 or 6 months imprisonment on anyone attempting to form a trade union. The law was to be in effect for the duration of the war because it was felt that the formation of a Union would lead to strikes and riots at a time when imperial solidarity was of utmost importance. The organisers decided to continue their efforts and to circumvent the ordinance they created a friendly society – the Universal Benevolent Association. Solomon became the first president, Nathan its secretary and Wilkes held the post of treasurer. By August 1917, they claimed they had a membership of 1500 and £208 in benefit funds. The Association’s main objective was the repeal of the Masters and Servants Act of 1849. This law saw as a criminal offence, the breach of the work contract by a labourer, however an employer who broke his contract with his workers was only liable for damages or wages owed, therefore his breach was only a civil matter. While recognizing the need to review the Act, the Colonial Office did not want to seem to be giving in under pressure. The concept of trade unionism was new in 1916. Workers tended to become organized on impulse as the frustration over low wages and poor conditions reached boiling point. Once their anger had been vented and the arrests, that inevitably followed, were made, calm would return, until the next time they became frustrated. The organizers of the UBA were offering sustained organization and collective bargaining power, but it was going to take a disciplined and educated workforce to recognize the advantages of unionization.